Wolfgang Polishin’ Pal is an ergonomically shaped urethane handle that holds specially designed foam pads using hooks & loops. Wolfgang really has a handle on detailing! A lot of die-hard detailers like to polish and wax their vehicles the old-fashioned way – by hand. The end result is a clean, beautiful finish and dirty, tired hands. If you want all the benefits of hand-detailing, but none of the drawbacks, use the Wolfgang Polishin’ Pal Combo. The Polishin’ Pal is an ergonomically shaped urethane handle that holds specially designed foam pads using hooks & loops. By gripping the handle instead of the pad, your hands don’t get so dirty and the shape of the Polishin’ Pal relieves hand strain. You can comfortably polish and wax your vehicle by hand without the fatigue you usually feel in your fingers. The Polishin’ Pal is 3 ½” in diameter and 2 ¼” tall. It features a finger groove all the way around for a comfortable grip. The urethane is very sturdy, yet flexible enough to bend against the curves and contours of your vehicle. This material is virtually indestructible! Use it time and time again and it will not lose its shape or deteriorate. The hook & loop material is secured permanently to the urethane so you don’t have to worry about the pad falling off as you work. The Wolfgang Polishin’ Pal Combo comes with four 3.5 inch Polishin’ Pal Pads, each designed to perform a particular step in the detailing process. Each pad corresponds to our larger Lake Country foam pads. You can almost duplicate the machine polishing experience by hand with the Polishin’ Pal and the included bonus pads! The white polishing foam is excellent for applying pre-wax cleaners and finishing polishes. 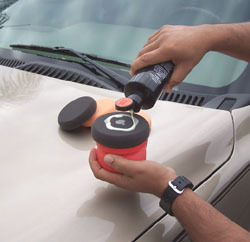 The foam has light cleaning ability to help polishes clean and brighten the paint more effectively. 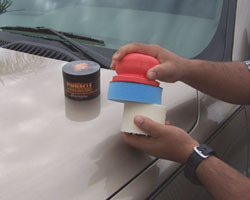 This soft, imported foam is ideal for applying the final coat of wax or sealant. The foam works especially well when applying liquid waxes or sealants because it is firm enough to keep the majority of the product on the paint, rather than soaking it up. The red foam has no cut or cleaning ability. Each of these pads can be washed and reused. Wash them in McKee's 37 Polishing Pad Rejuvenator in 3-4 gallons of water. Agitate with your hands or with a brush and rinse. Let the pads air dry. Here’s a tip: store the dry pads in plastic bags to keep them clean for your next detail. When buying replacement pads for your Polishin’ Pal, buy Spot Buffs 3.5” pads. You can give your vehicle a tender hand-polishing without getting your hands dirty! The Wolfgang Polishin’ Pal Combo and introductory 3.5” pads make detailing your vehicle a clean and comfortable experience. Yes, I've used orbital polishers, and I can afford them. But nothing gives you the control and hands-on feedback that these dirt simple applicators do. If you're used to applying either polish or wax by hand with even a quality sponge applicator, you know that they tend to concentrate around the fingertips or knuckles. Not with these. They spread out the pressure uniformly over the surface the way it should be done. I'm not a guy to complain, but I think most anyone could wax and polish all day with them. ConsBecause of the inflexibility of the applicator surface it's hard to get into narrow nooks or inset areas - but they are a small percentage and can be handled with a small cloth to supplement. I recently renewed my obsession for cleaning cars. The final step is waxing and I have a few cars to do. After hours of detailing and getting to this step you end up with hand cramps, or at least I do. This product alleviates the hand cramping while doubling as a wonderful applicator. I love this product as I can use the entire surface of the applicator to apply my wax and it is comfortable in my hand to use. Great Product again from Wolfgang. From a 70 year old hobbyist, really a great product. Used white pad for Klasse all in one polish, red pad for Klasse sealer and glaze. This made the products easy to apply and did not waste the polish and the sealer. Best of all kept my hands from cramping. Due to the weather conditions in the Northeast I haven't had a chance to use the item received. My order arrived quickly and in excellent condition. Online ordering was fast and easy.